Pensionize Your Nest Egg exhorts retirees to ensure that a good chunk of their income comes from sources that promise to pay a regular amount as long as they live. That advice is easy to accept given that one of the main risks in retirement is outliving savings. The next part of the book's advice - how to do it using a combination of three "products" 1) annuities, 2) portfolio of stocks and bonds, 3) guaranteed living withdrawal benefit (GLWB), a complicated insurance company product - is much iffier. This part of the advice is problematic for three reasons, first because of uncertainties around GLWBs, second because the list of retirement risks is incomplete, and third because the list of products or methods to handle the various risks is incomplete. GLWBs are worrying because they are complicated. There are various inter-acting moving parts that make them a challenge for the consumer, like resets and ratchets on the payout amount, choice of under-lying fund, initial payout rates, and fees. How can a consumer compare offerings from various companies and know which deal is better? Quite competent folks like Peter Benedek's Retirement Action here, Joe Tomlinson on Advisor Perspectives here and Wade Pfau on Advisor Perspectives here have crunched lots of numbers and the best choice of what to do seems to depend a lot on assumptions. A key tool created by author Milevsky and promoted in the book, the RSQ and FLV calculator, does not put a GLWB into the mix. It only includes an annuity and a stock & bond portfolio. Why not? We are told it is "beyond the scope of this book". The reader is told to consult a financial advisor. Yet on the same QWEMA website, there is an ad for the PrARI calculator, aimed at financial advisors which does include the missing GLWB component, as well it seems, as other missing pieces like unexpected lump sum expenses. The book and the free tool look more like an illustration of concept designed to drive readers to seek out financial advisors than a practical self-serve solution usable by a DIY investor. A question I keep asking myself was why I should even be interested in a GLWB. There is an excellent little table on page 66 where annuities, stock/bond portfolios and GLWBs are rated for how they offset the three big risks of inflation, longevity and sequence of returns, and for their benefits of legacy value/liquidity, sustainability and growth potential. Annuities and a stock/bond portfolio have exactly opposite offsetting Yes answers where the other is No, while GLWBs are either similar to one or the other, or in between i.e. GLWBs look superfluous. It's always interesting to think of the position of the product offeror (the old saying is if you are in a poker game and you don't who the chump is, then it's you), the insurance company that sells the GLWB. GLWBs may (it's hard to tell and that is worrisome - we could call it chump uncertainty risk) be a game in large about stock volatility risk. Benedek's simulations found that a GLWB customer was better off if stock volatility is higher. Similarly, this technical paper by Australian researchers from the insurance company perspective suggest that their profits would be highly sensitive to stock volatility, customer mortality volatility and interest rates. Another thought-provoking piece is about GLWB provider Ohio National's different and supposedly more effective and cheaper method of hedging its own risk. It raises the question whether some insurance companies might be headed for a big fall because they don't really understand and control the risks properly. The fact that Assuris covers GLWB income 100% up to $2000 per month and 85% above that (but this is only mentioned in the book with respect to annuities and not explicitly for GLWB payouts as well) helps on the income side but not on the legacy side if the insurance company screws up. Do we really want to be trying to also assess how well the insurance company will handle the investment account to pick a GLWB? Retirement Risks to wealth and income surely include more than the three (inflation, longevity and market sequence of returns) the book lists. Unplanned events like one-time or chronic health problems, divorce, (grand)child care, elder care can create large negative financial effects. There may be a need for on-going higher cash flow, or a big lump sum. There is a greater requirement for liquidity and flexibility than only an end of life legacy goal the book discusses. Though the book's stated aim is solely to describe how to create a guaranteed lifetime income, the process it proposes excludes such other considerations. Those considerations cannot be separated when deciding how much to pensionize. If you pensionize too much in order to ensure long term sustainability you may suddenly be caught short. Some things like health risks can and perhaps should be handled with long term care insurance but perhaps not if a greater amount of capital is kept in a stock/bond portfolio or if a no-longer needed house can be sold to pay for LTC. Alternative products and methods to address income/lump sum needs are incomplete. The single best inflation protection product is inflation-indexed aka real return bonds, yet they are not discussed or incorporated into the planning. The historical stock & bond return and volatility characteristics in the book are taken as given and baked into the RSQ-FLV calculator, yet new portfolio construction methods offer convincing promise to significantly lower volatility (e.g. see this individual investor Smart Beta portfolio). The pension fund and institutional investor world has moved to controlling risk/volatility to improve the return vs risk ratio and individual investors can too to some degree. Even a traditional but more diversified portfolio (i.e. more varied asset classes) will improve the return vs risk figures used by the authors. Changing the historical assumptions about an investment portfolio's performance can appreciably reduce the likelihood of running out of money using a systematic withdrawal plan, improving its attractiveness in the product allocation structure the book presents. That's what the book is missing in my view. What the book does discuss is really well done and worth reading. The writing aims at a general audience. It has lots of good illustrations, clear uncomplicated explanations without difficult technical or mathematical material, very much like Milevsky's other excellent books that simplify and explain potentially confusing subjects. The free online RSQ-FLV calculator still provides insight despite its limitations. Another calculator created by Milevsky the book refers to, the Implied Longevity Yield calculator on Cannex, is very helpful for trying to decide whether current annuity payout and interest rates are propitious for buying an annuity now or later. The book is to be applauded for forcefully making the critical point many people do not seem to realize that an RRSP balance (or the proposed PRPP) is merely a savings plan, not a pension, since it produces no automatic, guaranteed lifetime income. And they also make the equally critical point that most people need and should have real pension income (except those like Warren Buffett who has so much money he could never possibly run out). 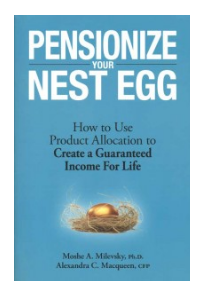 Bottom line: pensionization via product allocation is a worthwhile approach but what the authors leave out is too important to make the book's content good enough for practical retirement income planning. 3 out of 5 stars.